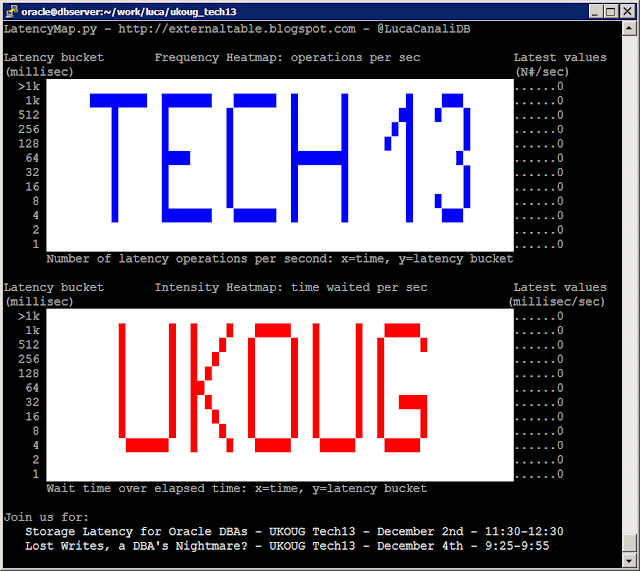 I am looking forward to participating again to the UKOUG annual conference. This year I will present together with my colleague Marcin Blaszczyk on two topics that are follow-up of articles in this blog. The first talk is: Storage Latency for Oracle DBAs. A presentation about a performance tuning techniques for Oracle and storage, based on the study of latency wait event histograms and their representations with heat maps. It will be a good occasion also to show examples of the usage of OraLatencyMap and PyLatencyMap. The second talk is: Lost Writes, a DBA’s Nightmare? This is a short presentation about lost writes in Oracle, based on our production experience. It’s still surprising to me how such a seemingly unimportant failure class can in reality generate very complex failure and recovery scenarios. If you are participating to the Tech13 conference, feel free to come and talk to us! Our presentations are on Monday morning (11:30 in the hall Exchange 4/5) and Wednesday morning (9:30 in the Exchange Auditorium). VirtualBox 4.3.4 was first posted on November 30, 2013 at 11:19 am. Where does the Exadata storage() predicate come from? Jean Claude Van Damme : Volvo was first posted on November 29, 2013 at 11:43 am. In a previous post we had seen how to setup and create an Oracle 12c Data Guard Physical Standby Database. Remember Data Guard is set up at the CONTAINER database level and not at the PLUGGABLE database level. 又有新的数据库中文文档添加到 My Oracle Support 中了!